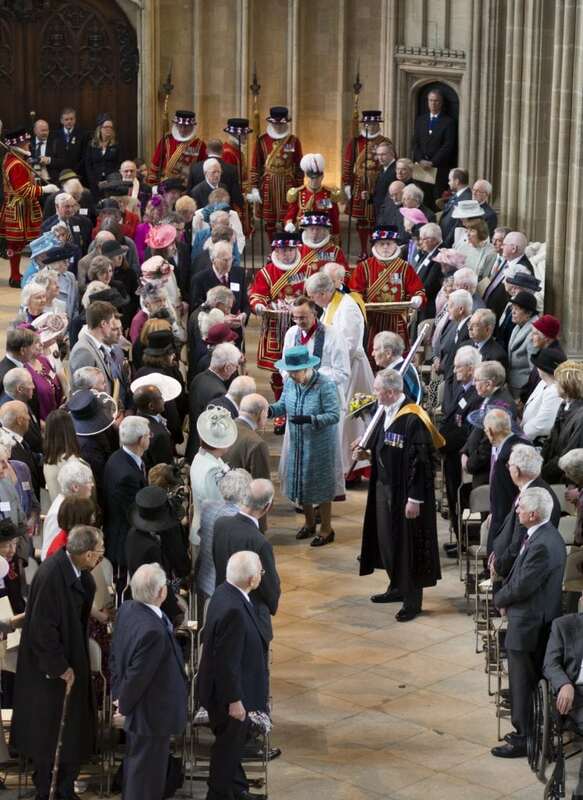 The Royal Maundy Service will be held in St George’s Chapel this year. Royal Maundy was previously held in St George’s in 2016, the year of The Queen’s 90th birthday. On that occasion 90 women and 90 men from all over the country received Maundy money in small leather purses handed to them by The Queen. This year there will be 92 men and 92 women receiving Maundy money from Her Majesty; this is because since the 15th century the number of recipients has been related to the years of the Sovereign’s life. Please note that attendance at the Royal Maundy service is by invitation only. Services open to all during Holy Week (including other services on Maundy Thursday) and at Easter are listed [here]. For further information about St George’s and Royal Maundy please click here. The photograph shows Her Majesty during the distribution in 2016. The Queen is followed by the Royal Almonry team and, in the background, Yeomen of the Guard carrying the alms dishes on which the leather purses containing the money are kept before distribution.